At least it's a win for campers and another choice. This one retails for $299 including courier anywhere in Australia. I bet many of you are over the cheap pop-up showers, which rot in U.V. anyway and break weak poles in wind. beats the hell out of what I use. A couple of star pickets, a tarp and a canvas shower bag under a tree is all I use . 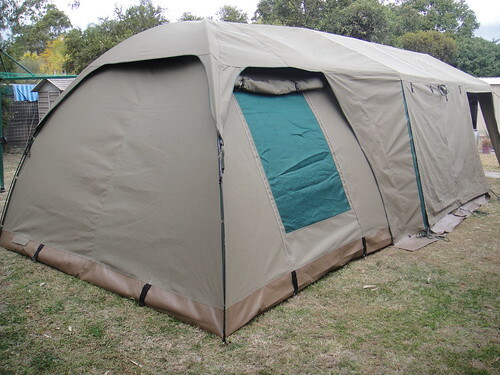 Seriously though, I thought I'd also mention they use the same canvas on their new generation canvas tents. I deemed this worthy of sharing since I had instigated it in the first place months ago. If you visit the website and videos in the link above, the guy talks about the fabric. It's new generation Aussie ripstop canvass, U.V. resistant tripple sponge rolled through vats of mildew and waterproofing chemicals. 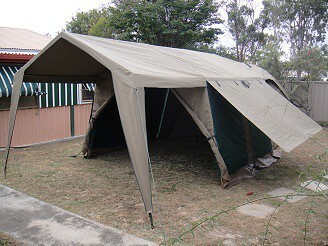 I have one of their Senior Bush Baby lodge style tents as well. I'll post a pic of it. The canvas does not need any other treatment by the owner - I believe at any point of it's life, however being a shower, I'd use a bush and beach wax sealant on the inside so soap scum washes off, then re-treat. The following is designed to also have a wooden floor in the living area as semi permanent accommodation (cabin.) Same canvas though.